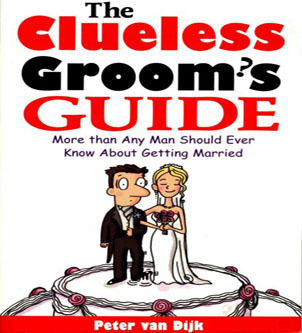 The Clueless Groom’s Guide by Peter van Dijk is a book that is above all humorous, but peppered with facts that every groom should know, but may not have thought of. Let’s face it, most grooms would prefer to get their advice in an entertaining and funny way rather than it all being too serious and scary! Especially when they may be feeling a little vulnerable. The topics covered range from ‘The Proposal’ to ‘The Ring’, ‘The Dress Code’, ‘The Vows’ and all the other bits and pieces in between. A really funny section is right at the back of the book – ‘Helpful Lists’. ‘Ten Things You Need To Know To Get Happily Married’ is one area covered e.g. ‘She will not promise to ‘obey’ you. Don’t ask.’ ‘Five Synonyms For Wife That Will Not Amuse’ – it all sounds rather frivolous, but it will add a bit of light relief to what can be a stressful time, especially if your share the funny bits! This book, written by Peter van Dijk, is well worth a look. It’s available now at the Bridal Survival online store. The Conscious Bride by Sheryl Paul is a ‘take a breath’ sort of book where you will recognize yourself or others around you and give you insights into the reasons things can unravel, in what should be a very happy time. That said, it is a very sensitively written book that explores why there may be tension, anger, sadness and stress around the engagement, wedding and first year of marriage. The reasons you are so emotional, as are those around you, are explained and as you read the book,you can recognize feelings and feel relieved that you are not alone – there are many brides and friends and families of the couple who are experiencing exactly these feelings too! Putting into words and explaining what you are feeling diffuses the enormity of those feelings. For example – “…the bride is in the midst of a rite of passage that involves a difficult and painful process of separation. But separating involves more than one person……mothers trying to let go of their daughters, fathers trying to reconcile the fact that they are no longer number one ……friends trying to accept that the bride will no longer be chatting as freely with them….” This is an insightful, gentle book that is a ‘must-read’ for everyone involved in planning a wedding. Sheryl Paul also has a website Conscious Weddings, with exercises, rituals and even a discussion forum so you can chat with Sheryl and other brides. 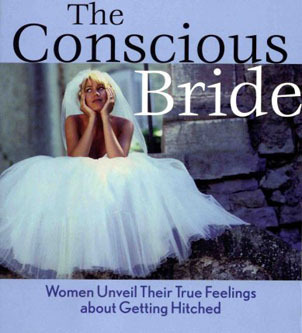 The Conscious Bride by Sheryl Paul is a book I would recommend to any bride. It’s available now on the Bridal Survival website. You’re engaged and suddenly your head is filled to the brim with ideas, numbers and random dreams. Where do you put it all in an organized fashion? In a Harry and The Princess – The Wedding Planner of course! Presented to you in a pink and green cover with a vintage feel, each section is clearly labeled and divided with card on which there is a delightfully whimsical picture guaranteed to make you smile! 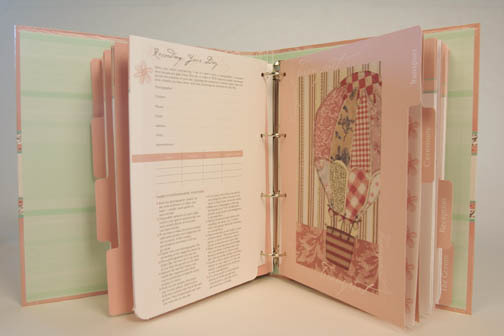 Each section contains tips written by Harry and The Princess themselves, to give you ideas you may not have thought of. There are lots of sections in which you can make notes on matte paper. For instance in the section labeled ‘Flowers’ there are tips, a place to write down your florist’s contact details, and a list of the places and people you may need to provide flowers for. There are pockets provided to put all those brochures and receipts and other bits and pieces you will collect in each section. At the front of the folder there is even a handy timeline which you could mark off as you do each ‘job’. 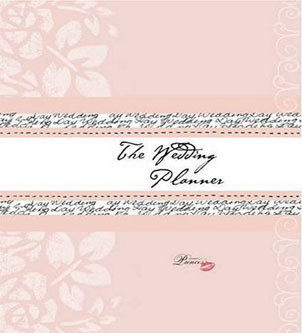 This folder is pretty enough to keep as a memento of all the planning you did for your wedding day. Please note, the Harry & The Princess wedding planner is now out of print and unavailable.